OR (attr = attribute); Please post your queries in the comments if you have got alternate solutions, I would be pleased to have a look at them. Yesterday, I was reading through some articles and happened to glance through a very memorable quote by Berthold Auerbach – “ The little dissatisfaction which every artist feels at the completion of a work forms the germ of a new work “. That was when I realized I haven’t yet completed my dimension attribute article and so here I am with the second part. 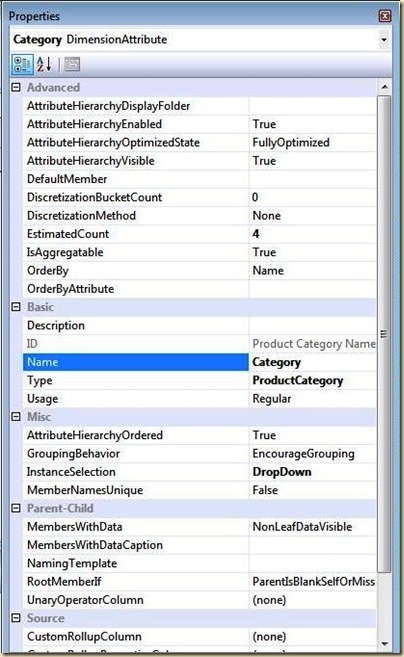 In SSAS Dimension Attribute Properties : Part 1, we reviewed the Advanced and Basic properties of dimension attributes. This article would be continuing with the Misc, Parent-Child and Source properties. 1) AttributeHierarchyOrdered : This particular property specifies whether the members of the attribute are ordered or not. The values of this property can just be True or false. If the order of the members do not matter, setting this property to false for attributes where the attribute hierarchy is enabled or high cardinality attributes can significantly increase the processing performance. 2) GroupingBehavior : This property is used to give a hint to the client application whether to encourage or discourage users to group on this attribute and does not affect any of the structures on disk. The values are EncurageGrouping and DiscourageGrouping. None – (Default) no selection used. DropDown – Appropriate for situations where the number of items is small enough to display within a dropdown list. List – Appropriate for situations where the number of items is too large for a dropdown list, but not large enough to require filtering. 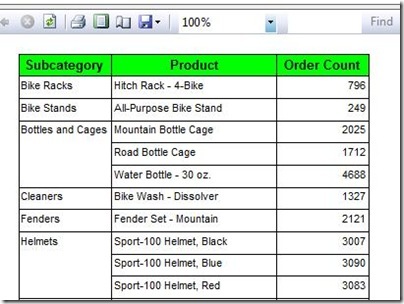 Filtered List – Most useful in scenarios where the number of items is large enough to require users to filter the items to be displayed. Mandatory Filter – Appropriate for situations where the number of items is so large that the display must always be filtered. 4) MemberNamesUnique : This property indicates whether the member names are unique across the attribute hierarchy and this property affects the way member unique names are generated. The available options are True or False. 1) MembersWithData : In a parent-child hierarchy, some of the non-leaf members may also have data associated with them (unlike normal hierarchies, where the non-leaf members have a value equal to the sum of it’s leaf values). These members are called data members and are present only for parent-child hierarchies. This particular property is used to set the visibility of the data members in parent-child hierarchies and the available options are NonLeafDataHidden and NonLeafDataVisible. This MSDN article – Working with Attributes in Parent-Child Hierarchies does a very nice job of explaining this property with an example. 2) MembersWithDataCaption : This particular property is used as a naming template for the system generated data members. For eg, if we have the MembersWithData property set to NonLeafDataVisible, then a leaf member representation of the data member is added. For eg, if Jason is a data member, with Thomas and Tom as his leaf members, then there would be an additional Jason added as a leaf member. Now to differentiate between the leaf member and the data member (in this case, both are Jason) would be difficult and hence we can use a template like *(leaf member) as the value of this property. The asterisk symbol is a placeholder for the original name. So our example would become Jason for the data member and Jason(leaf member) for the leaf member. You can specify a name for the level by clicking on the Name column of the second row and entering for eg, Employee *. This will ensure that instead of Level 02, Level 03, etc., you will be getting Employee 02, employee 03 and so on. For more details, refer to the MSDN article – Defining Parent Attribute Properties in a Parent-Child Hierarchy. ParentIsBlankSelfOrMissing – (Default) Only members that meet one or more of the conditions described for ParentIsBlank, ParentIsSelf, or ParentIsMissing are treated as root members. ParentIsBlank – Only members with a null, a zero, or an empty string in the key column or columns are treated as root members. ParentIsSelf – Only members with themselves as parents are treated as root members. ParentIsMissing – Only members with parents that cannot be found are treated as root members. 5) UnaryOperatorColumn : We can control how members on a hierarchy (usually parent/child, but not necessarily) aggregate up to their parents by defining unary operators. 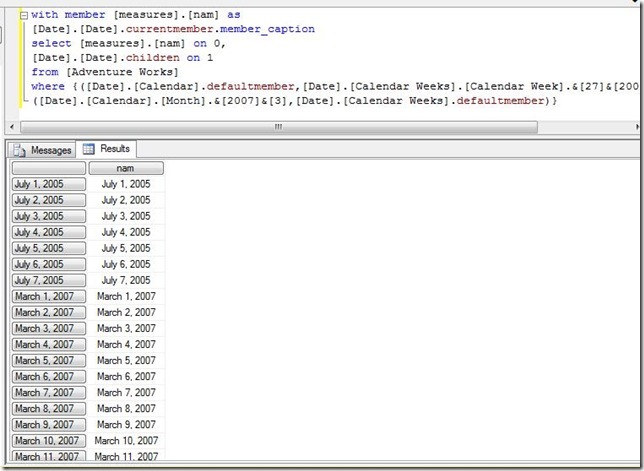 To do this, you must create a new column in your dimension table to hold the unary operator values and then set the attribute’s UnaryOperatorColumn property to point to it. This property specifies the column which holds the unary operator. 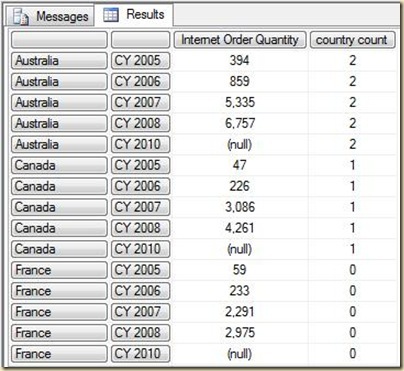 You will find a very good example under the Unary Operators and Weights heading of this article – Measures and Measure Groups in Microsoft Analysis Services: Part 1. The values are (none) and (new) for this property. On clicking New, a dialog box opens which will prompt us to select the binding type, source table and the source column. 1) CustomRollupColumn : Unary operators do not give enough flexibility for rollup, and in such cases, we can write our own rollup formulas as MDX expressions. This property is used to specify a column which will contain the custom rollup formula. A valid expression will ensure that the aggregation logic defined in the AggregateFunction property of the measure would be overridden for this attribute. 2) CustomRollupPropertiesColumn : This property is used to contain the properties of a custom rollup column. Refer Custom Member Formulas heading of this article – Measures and Measure Groups in Microsoft Analysis Services: Part 1 to learn more about the above two properties. 3) KeyColumns : This property contains the column/columns that constitute the key for the attribute, which is the column in the underlying relational table in the data source view to which the attribute is bound. If the NameColumn property is not defined, the value of KeyColumns property would be used to display the attribute members. 4) NameColumn : In most of the cases, the key of the attribute would be a integer value, and this would not make any sense to the user who is viewing the attribute members. For this, we can specify a column in this property which will have the user friendly name of the attribute member. Discrete attributes: Discrete values stand apart distinctly, and have clearly defined logical “boundaries” between themselves. The possible values are naturally discrete for the lion’s share of attributes occurring in the business world. 3) AttributeHierarchyOptimizedState : The values of this property can be FullyOptimized and NotOptimized (beats me why it shouldn’t have been a True or False instead) and is used to enable or disable the optimization of the hierarchy. Turning this property to a NotOptimized state would save resources when the hierarchy is being built during the processing and hence, should be turned off for those attributes which wouldn’t be used frequently for analysis. Turning this off would mean a slowdown in the requests that reference this attribute hierarchy which is the reason why we should just turn this off for less frequently used attributes. 4) AttributeHierarchyVisible :The values of this property can be True or False and is used to set the visibility of the attribute to a client application. If it is set as false, the client application would not be able to determine the presence of this attribute hierarchy (which means it would be invisible when the dimension is browsed through the application) but it would still be able to use the attribute hierarchy in queries. It is a best practice to make this property as False for those attributes which are also used in user defined hierarchies as anyways, you would be able to access that attribute from the user defined hierarchy and you can eliminate redundancy. 6) DiscretizationBucketCount : Discretization is basically the process of grouping contiguous values into sets of discrete values. Analysis Services supports several variations of attribute discretizations based on different algorithms and to enable it, DiscretizationBucketCount is one of the two properties that you have to set. As the name suggests, this property defines the number of groups that the values will be placed in. None – Discretization would not be done. Automatic – Automatically chooses the best grouping technique among the available values. EqualArea – If the distribution of contiguous values are plotted as a curve, then the areas under the curve covered by wach range would be equal. Cluster – Uses the K-Means algorithm to find ranges on the input values. Apart from the above algorithms present in the Dimension Editor, it is also possible to specify a user defined discretization method through Data Definition Language (DDL) by defining the boundaries of every group. 8) EstimatedCount : This property specifies the estimated number of members in the attribute. This is usually populated when aggregations are designed (which could mean that when you change environments, the counts could be of the previous environment unless you count again) or specified by the user. This property is used when aggregations are being built and helps the server to make decisions on how to make the aggregations. 9) IsAggregatable : This property is used to determine whether the data associated with the attribute members can be aggregated. If True, then the system will define an ALL level which will have the aggregated data which will be used as the default member when queries which doesn’t reference a particular member of this attribute are executed. For the same reason, if this property is set to False, then a default member should be specified. 10) OrderBy : This property specifies the method by which the attribute members should be sorted and the options are Name, Key, AttributeName and AttributeKey. 11) OrderByAttribute : This property is used to select the attribute on which the ordering should happen if AttributeKey or AttributeName has been used in the OrderBy property. 1) Description : This property specifies the description of the attribute and any free text can be entered. 2) ID : This property specifies the unique identifier of the dimension and is non-editable usually in the dimension editor. 3) Name : This property specifies the name of the attribute. General: These values are available to all attributes, and exist only to enable classification of attributes for client application purposes. Account Dimension: These values identify an attribute that belongs to an account dimension. Currency Dimension: These values identify an attribute that belongs to a currency dimension. Slowly Changing: These values identify an attribute that belongs to a slowly changing dimension. Update (23/05/2010) : I saw this blog by Brad Schulz (MVP) explaining this scenario and the performance implications in detail. So people who are serious about getting this in their code, please read his blog before you do so – Delimited String Tennis Anyone? One of the most common things I do during taking interviews is to give real life scenarios and assess the person on how he tackles the situation. Most of the times, what I really look for is how he goes forward in solving the problem – the approach and the way of thinking rather than the answer itself. Another thing that I look for is whether he tries to put some extra effort to implement the solution (especially the reporting part) in an aesthetic and user-friendly way. Most of the candidates would know the answer to some simple question like how to add data labels to their charts but they stutter when I ask what are smart labels or how can we prevent the cluttering of data labels. I would easily give brownie points to someone who details his solution with some extra attention to details. It must be my frequent rendezvous with creating big reports that make me extra fond of document maps in SSRS and an essential part of my SSRS interview questions. It is hard to imagine going through a big book that has no table of contents. But many users and developers have no problem at all in designing big reports without any navigational aid (although at some point of their wretched life, the users are going to curse the person who developed those reports), even though Microsoft has provided this feature. Document Map is a navigational feature in SSRS that, when implemented, allows the user to navigate through the document and its hierarchies. With this feature, you can add a panel to the left of the reports where you can have the list of “contents” of the report. What makes it more special is that on clicking the “content” in the list, you will be directly taken to the page where the content is present. Cool feature, huh? Requirement Suppose you already have a matrix or a table with some groupings as shown below Suppose the number of subcategories are very large and spans into multiple pages and the requirement is such that each user has to specifically search for a set of subcategories at a particular time of the day. It would make his life a lot easier if there was a document map listing the subcategories on clicking which he would be directly taken to the clicked subcategory Solution 1) Go to the design mode of the report and click on the group properties of subcategory. 2) Go to the advanced tab of the properties and set the Document map as the field Subcategory (you can select the appropriate field name from the drop-down). 3) Save the report, deploy it and then preview it . Already you can see the panel at the left hand side which contains the list of subcategories. To hide/unhide this panel, you can click on the icon that has been highlighted in red in the above image. Notice that the “Document Map” text highlighted in blue is the report name. 4) Now you can click on any of the subcategories, say Handlebars and you would be taken to the page where the clicked subcategory is. 5) (a) You can also make document map labels for each of your report item. For eg, if you have 2 tables, you can click on the table and press F4 to see the properties. 5) (b) You can give the required name in the DocumentMapLabel property as shown above and then see the required result when you preview the report. 6) Now that you have seen the toggle symbol, you would have already guessed that it is possible to create hierarchies also in the document map label, for e.g., Subcategory—>Product. For that, all you need to do is to enable Document Map property for the Product group also. 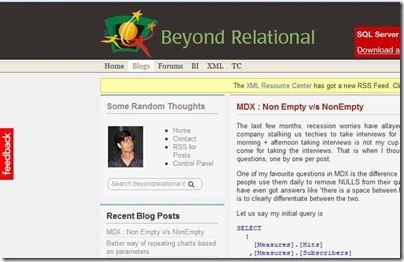 Note Quoting a section from Packtub Learning SQL Server 2008 Reporting Services – “ Document Map is mostly for HTML rendering. Other renderers render differently. Excel: Uses named worksheet with hierarchical links. Report sections appear in other sheets. Word document also has a document map like the table of contents. Tiff, CSV, and XML ignore this setting.